Last week I showed you my Fall Mantel and told you that I would be posting a tutorial about the paper leaf wreath I made as the feature of that mantel. I had gotten the idea that I wanted to make a wreath out of paper this year when I was awake in the wee hours one night and my mind was working overtime as it does then. Paper is one of my favorite mediums - next to paint and I love to create with it. I love how this turned out and how it contrasts with the black chalkboard I mounted it on. So without further ado I will tell you how to make this very simple wreath for yourself. First I decided I wanted to have book page leaves mixed in with ones made from the colorful fall scrapbook papers I have. I traced a "faux" leaf onto the papers and cut them out. It takes a while but if you are watching a good TV program the time passes quickly. Then I wadded each leaf up into a ball to make them look all wrinkly. 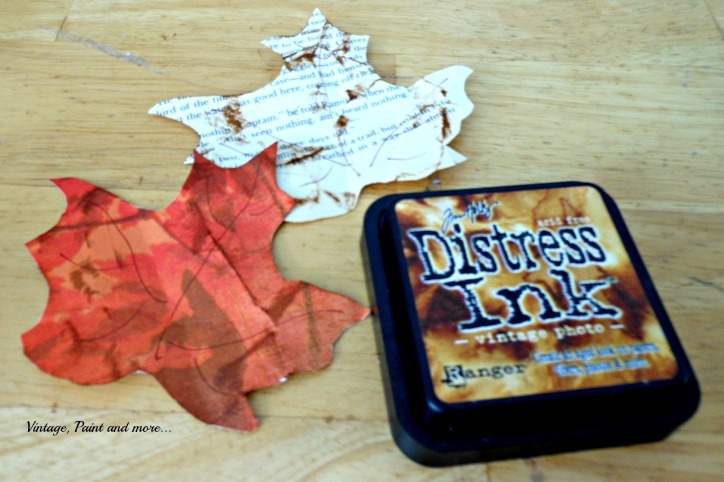 I then used a Vintage Photo distress ink by Tim Holtz to add some distressing to the edges and creases so the leaves look like they are old fallen leaves. These are the piles of leaves after they are distressed. I did not use all these and have some left over for another project later. I decided to glue the leaves to a grapevine wreath I picked up at Dollar Tree. It's about a 12" form so this wreath is not huge. I just began gluing them in a random fashion interspersing more book page leaves than scrapbook leaves. Just keep gluing them on the sides as well as the front to cover all the grapevine up. I somehow failed to take any more photos of the gluing process but it is quite simple. I left an area blank at the top and added a few "faux" berry and statis stems then a burlap bow I made. For this wreath I mounted it to a chalkboard I made from an old picture. I tied a piece of twine to the grapevine wreath and then to the picture hanger on the back making sure the wreath placement was to my liking. 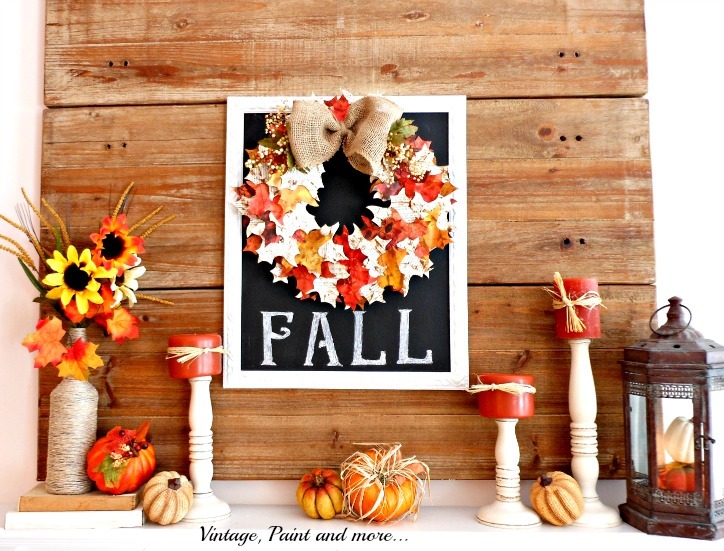 I had already written the word "FALL" on the board before tying the wreath so I would know exactly where to place it. This is how it looks on my mantel this year. I am really pleased with the way it turned out. Such a simple and easy project that cost me a total of $1 for the wreath form as I already had everything else. My kind of project. 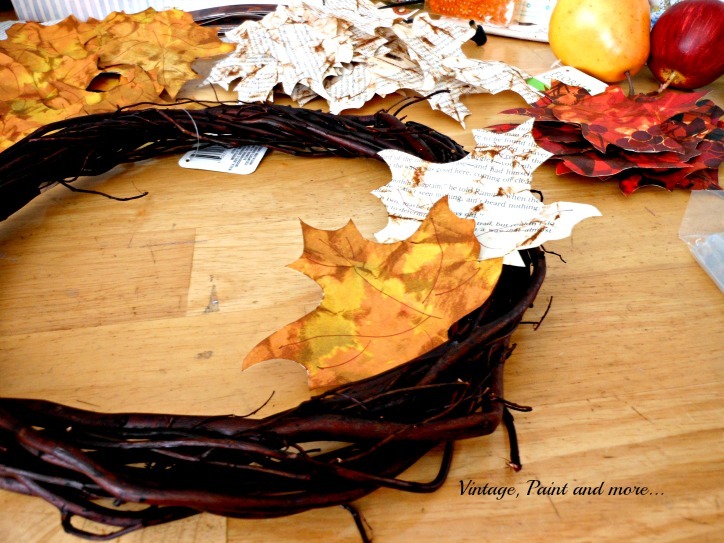 Are you making a change in your fall wreath this year? What are you planning on using? Tell me about it in the comments below - I answer all comments by email. I will be linking to the parties found listed on my Where I Party page. 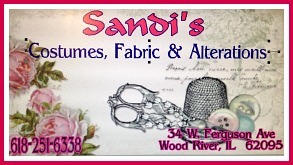 Please go visit and check out all the great projects found there. This is so pretty. I am definitely pinning and sharing! This is too cute! I am sharing this in my FB Group Uncommon Wealth! They will love it! Your wreath is so pretty! I don't decorate for fall since we don't really get fall weather, but I might just adapt this idea for my Halloween door wreath! Wow, that looks great! I have been trying for a few weeks now to make a wreath i've seen on pinterest but I can't seem to get it right! I love cut-and-paste projects! This wreath is beautiful! What a beautiful wreath! The colors are gorgeous and the distressing you did really added a beautiful dimension to your project! Great job on this wreath. I love the vintage, distressed look. Definitely an eye catcher! I love paper. It is such a great medium. Your wreath just proved it. I love your wreath! So pretty - and it looks perfect hanging on the chalkboard. Stopping by from the #bestofDIY party and pinning. :) Have a wonderful weekend! Cathy, thanks for sharing the tutorial for your beautiful wreath with SYC. I love it! Pinning. Thanks for sharing with SYC. Such a pretty wreath Cathy! Happy to feature you at our party this morning. Thanks so much for sharing! Gorgeous wreath. And how frugal! I love your idea. Thanks for sharing this. I want to try it! 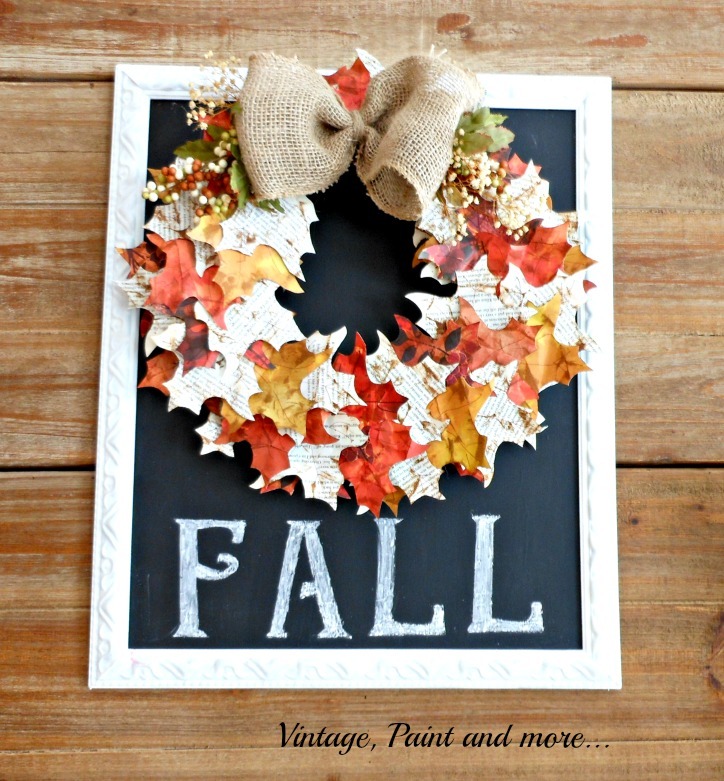 I'd love you to share at the Fabulous Fall Linky Party! Come and link up! I love a good wreath and this one is beautiful! 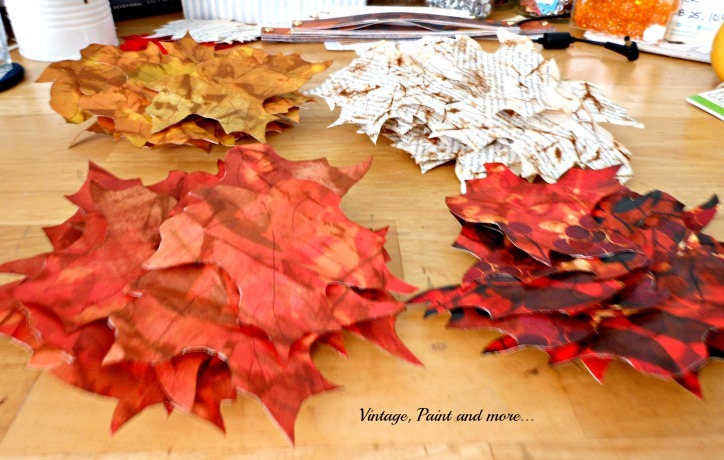 I love the paper leaves idea especially with a mix of book paper and scrapbook paper. Pinned! Your wreath is gorgeous! Now I want to make one. Thanks for linking your great post. I really do want to try this method. 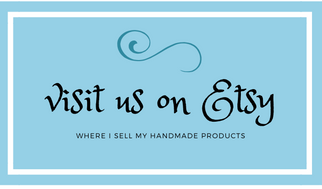 The linky runs to the end of the month so come by and link any Fallish posts! What an awesome wreath, I love it! 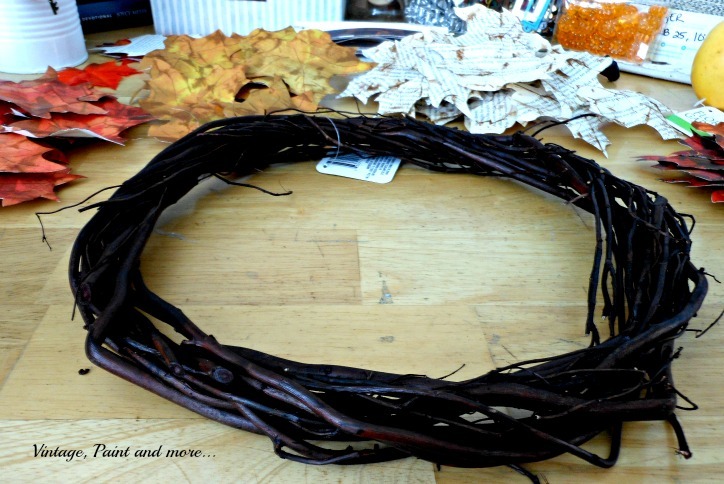 Thanks for linking up at Fridays Unfolded, I'm featuring your wreath this week in my post! Happy fall! I saw that you were featured and had to come over to pin! I've been trying to figure out my fall wreath, and at the same time I've been dying to use an old corkboard with bright yellow trim that my mom gave me. Both problems solved now! I'm going to use the corkboard on my door, with a white grapevine wreath on it! Thanks so much for the inspiration!